Frame being put into paper pulp.Close up of paper. When it came to deciding how to package our online orders for shipping, we knew, of course, that we wanted to wrap the textiles beautifully. Graham had picked up some Lokta paper in Nepal - gorgeous handmade paper with attractive plant fibres inlaid in the pulp. This is the perfect wrapping paper for our products, as it is strong as well as sustainable. Graham visited some Lokta makers whilst in Nepal, and we thought you might be interested to know a bit about how this wonderful paper is produced. 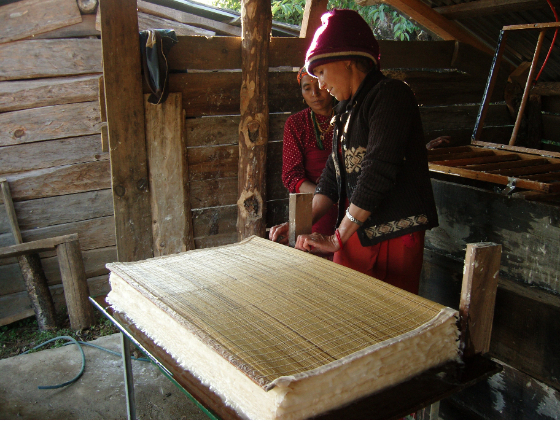 The art of making Lokta paper, or Nepali paper, is an ancient one, passed down through generations of local people in the Himalayas. It is made from the indigenous Lokta or Daphne Bhoula or Daphne Papyracea bush. Although there are many different species of Daphne, only five of them are suitable for paper making. The bush grows in the Himalayas at 2,000 to 3,000m (6,500 to 10,000 feet), and is capable of regrowth within 2-3 years of pruning, therefore making it a sustainable material. The paper is made by cleaning the bark of the Lokta bush and chopping it into small pieces which are then soaked in water for 5-6 hours. The bark is then boiled in a solution of water and soda for a further 1-2 hours. After washing in cold water, the material is beaten into a pulp, which is then poured into wooden frames and laid out to dry in the sun. The sheets of paper are usually 50 x 76cm in size, and are made in various weights. The edges are deckled, or left untrimmed. Lokta paper is extremely durable. It is resistant to insects and germs, and doesn't perish in water, making it ideal for dyeing with water-based dyes. It is used by the Nepali government for official papers.